As a house flipper, I've remodeled my fair share of kitchens. I think the count is reaching around 30 these days. In the beginning I wung it, but over time I've noticed a pattern develop. That is what I'll be sharing with you today. I usually, but not always, gut kitchens and start from scratch in order to make the most of the space. If a kitchen doesn't need complete demo, then score! But, even when I can salvage cabinets and such, I still go through the floor planning process, just to make sure there isn't an area where I can improve it slightly. Even if that just means adding a cabinet somewhere or removing one somewhere else, there is almost always a way to improve the space. No matter what the kitchen starts out as, I use the following five areas to increase both functionality and beauty in the new kitchen: the needs of a homeowner, functionality, space, symmetry and openness and design. The most boring task, but possibly the most important, is to look make a list of everything one will need to store. Consider anything that cannot currently fit in the kitchen because there's not enough room for it, such as a crockpot hiding in the laundry room. The worst thing you could do is design a kitchen that doesn't hold everything you need or is the wrong kind of storage for what you have. For instance, if you were to forget the mini appliances you have and then design a kitchen that has no place to put the mixer, toaster, panini press, etc. Back to the laundry room they will go. Look at the space with new eyes. Draw the outer walls of the room out on paper or use an app like MagicPlan. Remember to include windows and doorways. Now, you have nothing in the room, time to fill it up. Nothing has to go back where it once was, although it is less expensive if it can (plumbing/electric). Be realistic about what can fit in the room comfortably as well as how often you might actually use certain items. You may want that double oven, but realistically, you may not have room or more importantly, may only "need" it once a year. Place the large necessary pieces in the room first, such as the refrigerator, range, dishwasher and sink. These will take up a bulk of the space and are most important in getting placed in the layout. If there are bonus appliances, such as warming drawers, place those as well. Working Triangle: Check to make sure everything is reachable from a central location. You won't want to walk around an island to get to the fridge. Use a triangle set up as a good way to assure efficient use of the kitchen. Group Items: Some of the taller items can be grouped together on one wall if possible. The fridge and double ovens can sit together. If there is more room on the wall, pantry style cabinetry can help fill in the space. Dishwashers: These are typically on the left side of the sink, although not a hard and fast rule depending on what your space demands. If it can only go on the right, so be it. An example of this is below in the kitchen with the herringbone patterned floor. Refrigerator: If choosing a single door model, be sure the door will open in the direction most convenient for access. Most models have reversible door handles, but check just in case. In the photo of one of my homes below, you can see that the door handle is on the wrong side, forcing the door to open away from the rest of the kitchen. Whoops! I didn't catch this until I saw the listing photos! Luckily, this fridge had a reversible door and was easily fixed in a few minutes. However, the evidence remains. Now, add in cabinetry around the appliances. Check your list of storage needs to be sure the cabinets you chose address all of your storage needs. You should now have a rough sketch of your new kitchen now! Now it's time to check your work for space requirements. We want to make sure the kitchen has enough space to actually move. Check these factors to see if you're on track. Island: Is there 3-4' between the island and any other cabinetry and appliances? This is the appropriate amount of space needed to feel comfortable working and moving throughout the kitchen. Dishwasher: If you are standing at the sink and the dishwasher door is fully open, do you have enough room to load it safely? Dishwashers placed on a separate cabinet run rather than next to the sink create this issue. Range: Can you open it fully and maneuver around it safely and efficiently? Refrigerator: Allow some breathing room on either side so the door(s) can open fully. If it's shoved up against a wall, the door will bump into it not allowing it to open fully and stay open while you pull things in and out. Also, is there a counter space nearby that you can place things on is helpful. A deeper, but narrower sink allowing more space on either side for a few more inches of counter on either side. Eliminating or moving sinks from an island to create an expansive work space. Choose a 24" range instead of 30" in tiny kitchens. Choose a smaller refrigerator. Perhaps a single door as opposed to double door. Reach: Do all of the cabinets and corners allow for easy access? Do any of the doors bang into each other or create an awkward reach? If you're finding any of the above occurring in your plan, start rearranging until you find the best set up. If it's not working out, something might have to go. Now we're getting into the feel of your kitchen. Look at your floor plan and imagine yourself at several different view points. Is anything out of balance? Check for symmetry and openness. In each view you'll want to feel like there is proper balance with the items in the room. If there is a heavy thing on one side, balance it with a heavy thing on the other side. For instance, if the refrigerator is on the left side of the room and feels big and bulky, perhaps a range hood could balance it out on the other side of the room. Center the sink on the window or whatever it's backdrop might be, like how we did in the above kitchen. Determine what you balance points are and center the range between them, for instance, between a row of cabinets or between a wall and a tall cabinet. If there is a tall pantry cabinet on the end of a cabinet run, consider balancing the other side with an appliance garage or similar. Consider how open the room feels. Too many times we get wrapped up in shoving as much into a room as possible. Instead, go for a peaceful space with breathing room. Start cutting things. Remove some of the upper cabinets and replace with open shelving to make it feel less top heavy, as we did on either side of the window in the kitchen above. If you have a larger pantry, consider moving some storage items in there, maybe the microwave. Allow for an empty wall if you can spare the space. Now it's time to put the design together. Consider colors, finishes, patterns and materials when coming up with a design plan. While there are many different color schemes one could use, it's best to find some constraints to work within to develop a cohesive look. The Renovation Design Capsule I posted about recently was developed for this very purpose. Begin with something like this to guide you in your search of billions of options. When working from a palette, some of the features can be fulfilled beyond the kitchen fixtures. Remember that the room will not be complete until you fill it with things such as kitchen tools and decor. So, that white kitchen you might like but are worried will be too stark could be balanced out with wood cutting boards and artwork. if working off of the design capsule for instance, this is where wood tones and the navy blue (or any) color could come into play. Take your design capsule to the store(s) with you and choose materials that work with in that framework. Natural materials feel the most inviting which is why I use them in the bulk of my kitchens. Grab samples of countertops, cabinets, paint colors and tile. Take them home and lay your favorites together. You may find that even though you are obsessed with a certain tile, it just doesn't work with the whole look. Deciding at the store is possible, but remember that the lighting will likely be different than in your home. I typically like to at least take the samples outside to get an idea what the pieces look like in natural daylight. 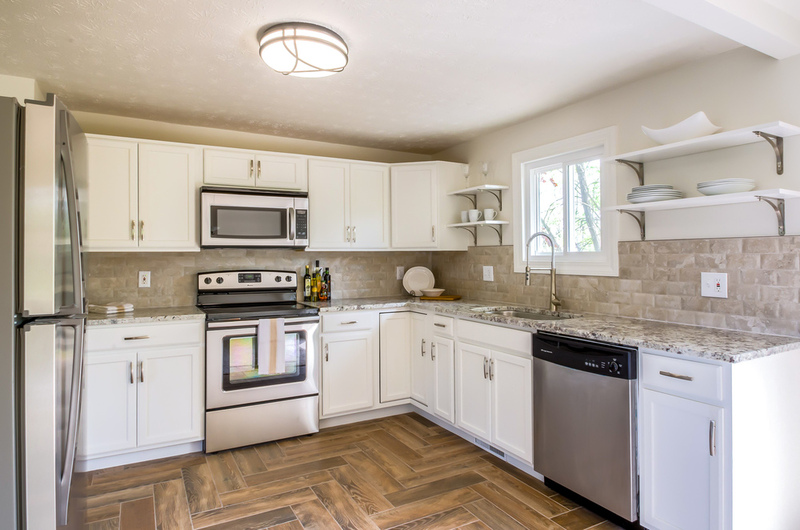 Once you have your flooring, backsplash, wall colors, cabinets and appliances chosen, add in fixtures and hardware. Choose lighting that won't interfere with the symmetry and balance you are going for in your kitchen. Heavy, bulky looking fixtures could ruin your line of sight and bring a top heavy feel to your kitchen. Continue on with plumbing fixtures and cabinet hardware. Feel free to mix finishes. This is "allowed" now. Finally, add in the decor. If you incorporated an empty wall, fill it with an art piece. Allow some beautiful items to sit out on the counters, such as wooden cutting boards and some kitchen utensils. Don't go crazy with this. You'll have a lot going on in here, plus you actually need to use this space. Leave yourself some room to do so. Now you're done! You should have a cohesive, well balanced feel to your kitchen while providing the storage and functionality you need. Subscribe on the right to get information and new product announcements straight to your inbox.